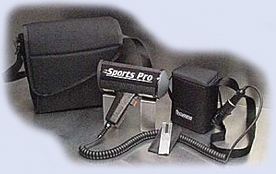 The Sports Pro handheld speed radar for sports is by far the highest performance sports radar on the market today. Durable - Premium design promotes long life. No other sports radar is faster or easier to use. Just point and pull the trigger and the Sports Pro displays the speed of the target instantly and accurately. The Sports Pro radar confirms the speed of the target to within +/- 1/10th MPH before it displays, no matter how weak or strong the signal at distances of up to 1 mile. The speed of the target is clearly displayed on the Sports Pro radar's bright, easy to read LED's. This sports radar will read most anything that moves. However, anything that moves erratically will give erratic readings, including people running because of the jerky motions of the legs and arms. We don't recommend the Sports Pro radar for accurate readings of such erratic motions because the readings bounce around too much. However, all ball motions and virtually all other sports applications give excellent results. Best results are obtained when the target is moving almost directly toward or away from the radar. For instance, at a 5 degree angle, the error will be less than 1/2% too low. In other words, the Sports Pro will read an actual 50 MPH target at 49.8 MPH. There is correspondingly less error at smaller angles.